The Department of Life Sciences had organized a guest lecture entitled “Trends and Opportunities in Biotech Industry” as a part of the Corporate Interface Connect as well as placement initiative on 11 December 2018.The resource person was Dr S S Easwaran, Academic Director, Biocon Academy, Bangalore. The talk was held in the Council room, Central Block, Main Campus, CHRIST (Deemed to be University). Dr. Easwaran talked about the trends and opportunities in the biotech sector, and the expectations of the hiring bodies in any biotech industry. He presented the current scenario of the global Biotechnology sector, regarding the revenue it generates and also the growth it had attained in terms of research and development. 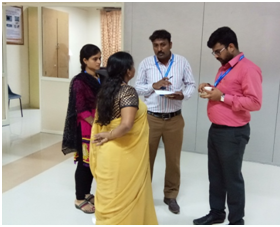 He concluded with the brief explanation of the course module running in the Biocon academy, and the placement scenario as of today. He talked about the qualities one should have in order to achieve success and stability in the career. 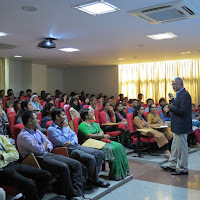 Faculty members and students interacted with Dr. Easwaran with respect to career prospects for life science students. A field trip was organized on July 19, 2018, for the students of 5CBZ and 5BCZ to the Fisheries Research and Information Centre, Hessarghatta Fisheries Research and Information Centre, Hessarghatta, as part of our course in Aquatic biology. 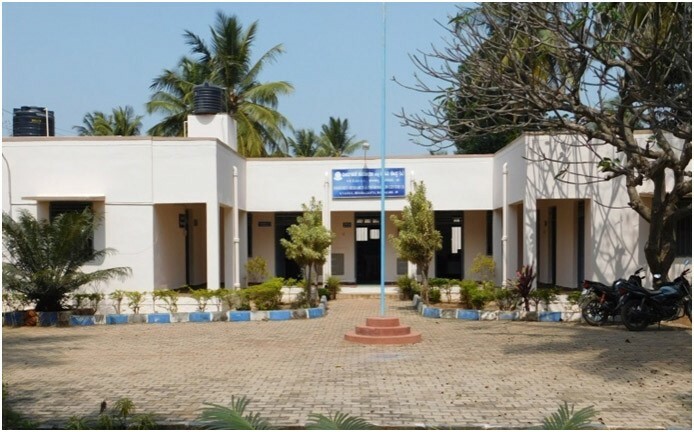 The research institute comes under the Karnataka Fisheries and Science University and was set up in the year 2004. It is located adjacent to the Hesarghatta Lake which is 25kms from Bangalore. The centre is located over a span of 10 acres of land. The main mandate of the institute is to supply good quality fish feeds and conduct research on improved variety of aquatic crops. The students got to know about the facilities and conditions required to culture various species of fishes, especially the common commercially sought fishes, rearing hatchlings etc. The students gained insights on the practical aspects of Fisheries. Prof. Ganesh and Mr. Deepak. Ms. Monica, instrumental engineer at Narayana Nethralaya explained in detail the working of instruments like Lasic machine, Keratograph, Eximer, Retinoscope etc. She conducted the session by beginning with the basic explanation of the human eye and its parts and affecting disorders. Therefore when the instruments were shown, the biology behind the study and interpretation of the related disorder was easily understood. Dr Nakl and Ms Monica clarified the doubts of students. It was really an enlightening session with respect to the study of human eye and its defects and possible causes and treatments were also explained. 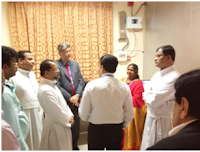 The faculty and students thanked Dr. Naik, Ms. Monica and all other staff members at Narayana Nethralaya for providing an opportunity to visit the hospital and getting to know the use of major instruments used in eyecare. MAPS (Marine Arctic Peace Sanctuary) is an effort initiated by award-winning Canadian musician, yogi, activist and author, Parvati, through her NGO parvati.org to protect the Arctic region from commercialization and pollution. In this regard, MAPS Ambassadors Uttama Anderson , Karen Ho and Mathew Edassery ( based in Canada) had preliminary talks with Dr Suma S (Dept of Life Sciences) and Prof. Phinu Jose (CSA) to initiate efforts in Christ (Deemed to be University) for protecting Arctic region. The first official video conference of MAPS officials with faculty and student lead volunteers of Christ was conducted on August 31 2018, Fridayfrom 8 AM IST, in the Council room, Central block, Main Campus of Christ.Christ University is the first educational institution in India to have such a collaboration with Parvati.org. Mathew and Karen Ho,the MAPS ambassadors were the resource persons for the Skype Conference. They gave a presentation on the situation in Arctic region and also gave guidelines for developing a collaborative strategy. This constituted a good opportunity for familiarizing the members with the purpose of the organisation and the need for immediate action. The students had a lot of queries to the MAPS ambassadors. The session was a collaborative venture by the Dept of Life Sciences and Centre for Social Action, Christ (Deemed to be University) and MAPS. 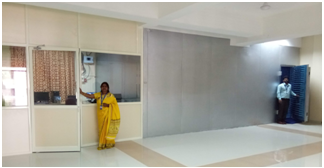 The establishment of RF & Microwave Research Laboratory with an Anechoic Chamber Facility under MRP funding has been completed recently in June 2018 by the Principal Investigator Dr S Suganthi. 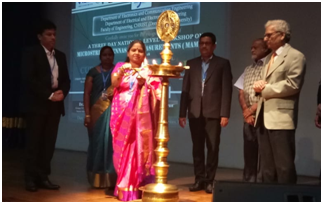 With a view to publicize its existence and to start the functionality of the established facility, a National Level Three Day Workshop on Microstrip Antennas and Measurements (MAM 2018) was proposed as an outcome of RF & Microwave Research Laboratory. This workshop MAM 2018 was organized by the RF & Microwave Research Centre through the Department of Electronics and Communication Engineering at Faculty of Engineering, CHRIST(Deemed to be University) during 5-7 July 2018. The explosive growth in the demand for information transfer using handsets and personal communications devices has created the need for major advancements of antennas. One type of antenna that fulfils most of the wireless system requirements is the planar antenna. It finds increasingly wide range of wireless applications in handheld mobile devices, satellite communication systems and biomedical applications. The existence of our Anechoic Chamber facility has been publicized & promoted with brochure & invitation attachments through more than 800 email IDs across the country & a few abroad too! The complete arrangement was fully supported by Mrs.K. Inbanila, HOD, ECE. 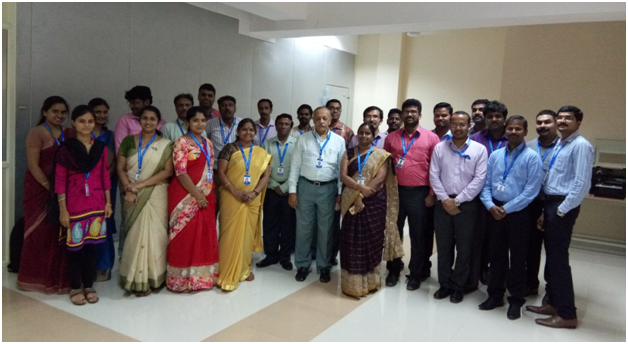 This three day workshop was exclusively envisioned for faculty members, research scholars and PG/UG students of ECE and participants from industry to have an exposure to current trends in planar antenna technology and hands-on training with HFSS for simulation of antennas. 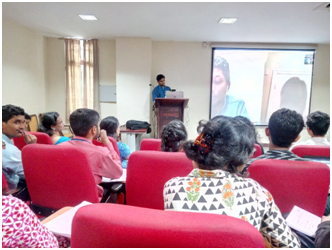 Members belonging to CSE, EEE & other branches, who showed interest in the collaborative research work, were also invited. 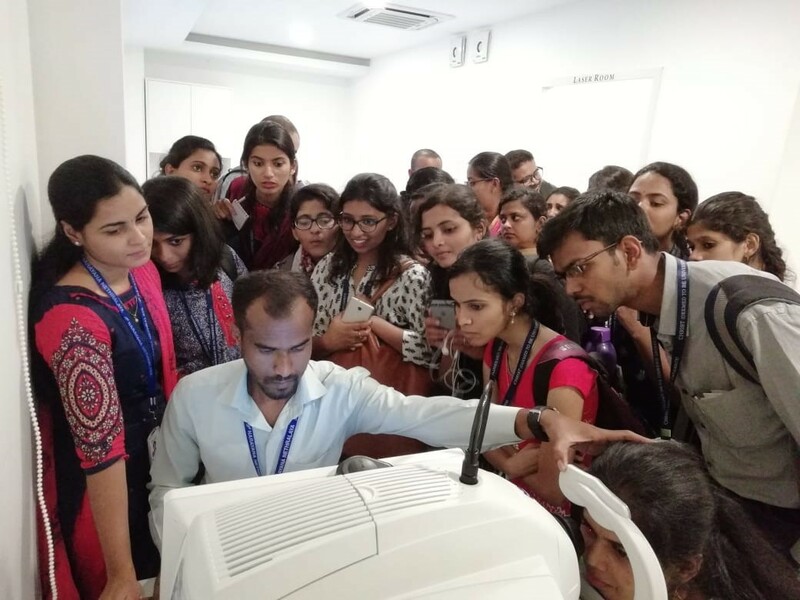 There were five resource persons, 10 members from vendors side and 41 participants from various institutions across country as well as from CHRIST University made the show a grand one! The MAM 2018 was colorful and fruitful with resource persons ​Dr Raghavan NIT -Trichy, Dr Surendra Pal, ISRO /D​RDO-DIAT- Pune, Mr. Puneet Kumar Misha, ISRO Satellite Centre-Bangalore, Dr Shiv Narayan, Senior Scientist, CSIR, NAL-Bangalore and Dr S Suganthi, Professor, CHRIST(Deemed to be University). The event was started with devotional invocation dance & song followed by lighting of lamp. Mr.Shashikumar, coordinator of workshop welcomed the gathering. Dr Iven Jose, Associate Dean, the living example of dynamic leader, delivered the presidential address and described the importance of the workshop and its connectivity to the industries and academia. Dr Surendra Pal, Former Vice Chancellor of Defense Institute of Advanced Technology(DRDO), Pune and Distinguished Scientist, Associate Director and Program Director, Satellite Navigation Program at ISRO Satellite Centre, Bangalore presented Inaugural Address. He elucidate the importance of RF & Microwave and the need for keeping this field active to keep in pace with changing technological trends. 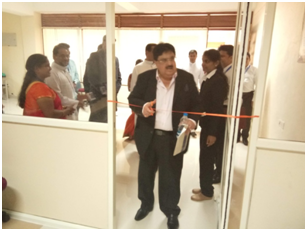 Dr S Raghavan, Senior Professor of NIT Trichy illuminated the presence of newly opened Anechoic Chamber at our campus and explained how the existing facilities can be utilized and improvised with newer ideas and modern instruments. He pointed out the capacity for the interconnection of platforms, systems, and applications of the RF & Microwave components & design by highlighting the ways for reputed publications as outcome of quality research. He also provided suggestions for future events to be in association with IEEE Antennas & Propagation Society for engineering services to reach out the society. Dr S Suganthi delivered the exploratory development of anechoic chamber from the scratch. She acknowledged the support provided by university authorities, recalling & recognizing the contributions of her fellow members and other great personalities who supported the journey of establishment of Anechoic Chamber. Thereafter all the guests and vendors visited anechoic chamber to witness the facilities. It was a memorable grand show for three days. On the first day after the inaugural session, Dr Surendra Pal explained the significance of antenna polarization. He mentioned that the methods of antenna and microwave subject content delivery should be changed to attract the younger students of this era. 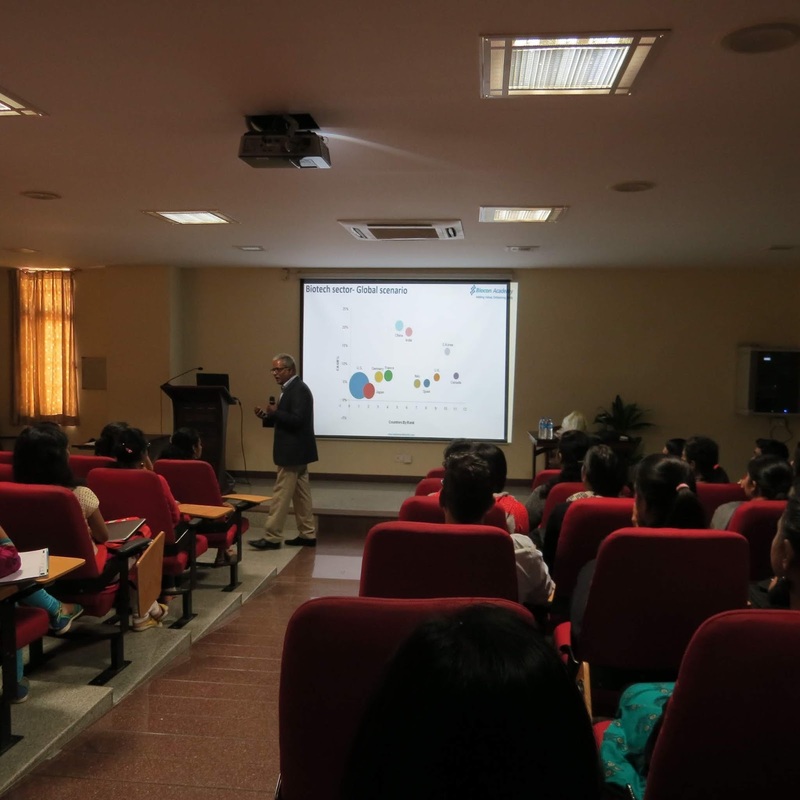 Further, Dr Raghavan presented intricacies & design aspects of MIC filters. He insisted the inclusion of innovations in teaching without diminishing the fundamental concepts and teaching methods. 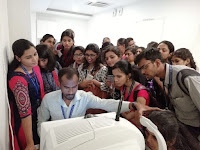 He spoke about the importance of writing our own coding for the antenna designs using computational electromagnetic methods and MATLAB instead of merely using commercial softwares alone. He projected the importance of motivating students to become successful RF engineers for servicing to the humankind nationally and internationally. Dr Puneet Kumar Mishra, Scientist IRSO Satellite Centre, Bengaluru delivered technical talk on the trends in antennas and measurements explaining the challenges involved in ISRO space missions through several examples of ISRO projects. He explained the need for RF engineers for space programmes. Dr Shiv Narayan , Senior Scientist, CSIR, NAL, Bengaluru presented a fascinating talk on the design challenges involved in antennas for Aerospace applications and the need for radomes. He took the audience to a greater level of intellectual thoughts through his technical content on FSS and metamaterial structures. 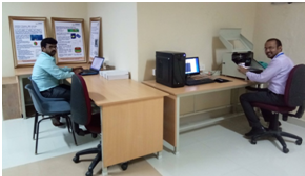 Second day, the vendor Mr.Kaviyarasu from Entuple Technologies provided hands-on training to the participants using ANSYS HFSS EM simulation tool using 25 user licensed software available in the department laboratory. During post lunch, Mr.Naveen from Anritsu presented demonstration on the usage and capacity of Vector Network Analyzer (VNA). Third day, Dr Suganthi presented a technical talk on the antenna design. During her presentation, she explained the techniques to design fractal & metamaterial antennas and presented the methods to develop MATLAB codings for the same. Her presentation was well appreciated by participants and a few became motivated for focusing their research in the fractal antenna design. The highlights on the participation of vendors were focused towards arrangements for hands-on training, demonstration and antenna measurements for the benefit of participants. The participants were researchers, faculty members & students from NIT-Trichy, NIT-Suratkal, PES University, Anna University, Reva University, BNMIT, Siddaganga Institute of Tech., St.Joseph Engg. 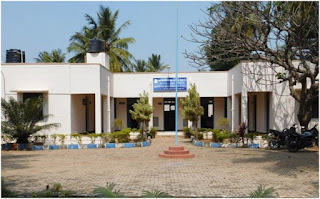 college, K Ramakrishna College of Engg., ECE, EEE & CSE depts. (CHRISTITES). The researchers were encouraged to take chance of getting the measurements for their own antennas brought by them. They were happy and expressed gratefulness since this rarest chance could help them for producing journal papers as outcome of their research. Many eminent personalities in India & abroad had sent wishes for the successful conduction of the workshop. 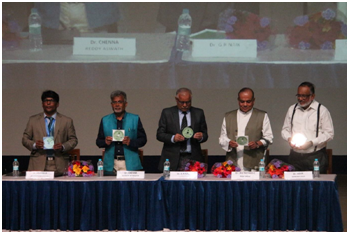 This includes the wishes from Dr Bharathi Bhat (Retired Eminent Professor, IIT Delhi, currently into spirituality), Dr D Guha (Professor, Institute of Radio Physics, Kolkata, InCAP Organizer), Dr E Alphones Arokiaswamy (Professor, NTU, Singapore) and Dr Chinmoy Saha (Professor, Indian Institute of Space Technology, Trivandrum) had sent their wishes for the success of the workshop! The event was well taken by all the participants. In general, the feedback from participants spells one’s strength/weakness! ​In MAM 2018, it was very much encouraging & positive with unanimous request for conducting many such useful future events. They went to the extent of requesting the organizer for mentoring them in the area of RF & Microwave! The MAM 2018 spells adorable success through everyone's involvement, cooperation & contributions! The ECE Department has a rich tradition in research and teaching. The research interests of the faculty members of the department encompass the wide area of applied and fundamental aspects of ECE. Collaboration in between the research groups of the department and with other departments is also a practice. It cultivates research aptitude among members through three major verticals RF & Communication, Signal Processing & Optical Imaging and Embedded Systems & VLSI. 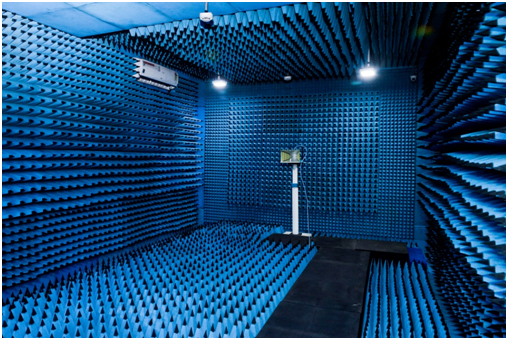 The Anechoic Chamber is an emergence of the efforts of Dr S Suganthi (whose majority of career life time experience being in the RF & Microwave field) to explore the ambient energy harvestment using microstrip antennas (rectennas), innovation in fractal, metamaterial antennas, implantable antennas, filters & other MIC components. With her gained confidence through the stay at ISRO Satellite Centre as Project Trainee for her post graduate project work and the exposure to various sophisticated satellite communication related instruments available over there, further, the contacts and visits made to TCE-Madurai, IIT – Kharagpur IISc, NAL, ISRO CATF- Bangalore, NIT-Trichy, DIAT-DRDO-Pune, NTU-Singapore for witnessing the structure and facilities of Anechoic Chamber, the Anechoic Chamber at Faculty of Engineering has been established. Her venturing dream was liberally supported by CHRIST management to fund and henceforth a state-of-the-art research laboratory has come to reality today. 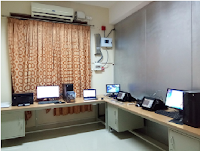 The RF & Microwave is a Research Laboratory established in the ECE Department which caters researchers to explore the field of wireless communication with respect to conventional, planar antennas and RF systems including investigations on meta materials, fractals, biological effects, implantable & energy harvestment. This is first of its kind got established newly at our University amidst all the other engineering institutions and private universities existing across Karnataka state. This Research Laboratory provides a complete platform for simulation of various antenna designs using HFSS EM simulator version 18.2. The components and antennas designed through software or conventional methods can be fabricated as prototype model using PCB prototyping machine. This machine is capable of engraving, drilling and cutting the shapes of the designed antennas and components using substrate boards such as FR4, Roger etc. 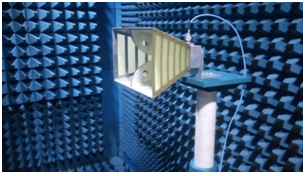 The experimental verification and validation of such antennas, components & RF systems can be carried out using the state-of-the-art measuring instruments such as Vector Network Analyzer in the 1 MHz- 40 GHz, Spectrum Analyzer in the 9 kHz – 43 GHz and Anechoic Chamber measuring a size of 7m x 4m x 3m for frequency coverage of 800 MHz- 40 GHz. The long term goal is to develop this laboratory as a center of excellence for microwaves. The GRAND INAUGURATION OF THIS ANECHOIC CHAMBER was celebrated on 20 May 2018. The chief guest of convocation ceremony Dr Souvik Bhatacharyya, Vice Chancellor, BITS Pilani and the eminent personalities of our University Dr Fr George Edayadiyil, CMI, Chancellor, Dr Fr Abraham V M, CMI, Pro-Vice Chancellor, Dr Anil Joseph Pinto, Registrar, Prof. Johny Joseph, Controller of Examinations, Dr Fr Benny Thomas, Director, FoE and Mr Jugnu Uberoi, First batch Alumnus(CHRIST) & President, Christ University's Alumni Association visited the research laboratory along with Dr Iven Jose, Associate Dean, FoE and Heads of departments of CSE/IT, Civil, ECE, EEE, Mech, HAS and Architecture for the inauguration and blessed. Further, our Reverent Dr. Fr. 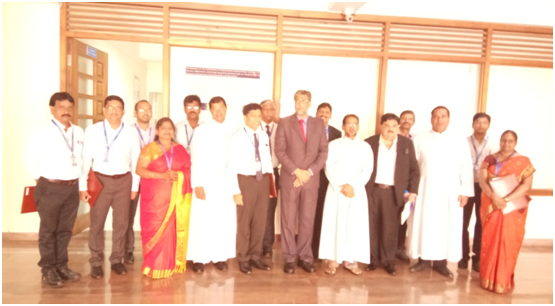 Thomas C. Mathew, Vice Chancellor visited the anechoic chamber on 30 June 2018 along with Fr. 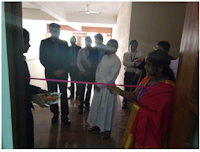 Antony Puthussery, Campus Director and offered his best blessings. Followed by this incident, all the faculty members of the department of ECE were invited to witness the full-fledged facility of the anechoic chamber on 04 July 2018. This was exclusively done with a view to keep them aware of the entire facilities for any collaborative works and also to take inspiration for their academic and research blends. The UG, PG & PhD scholars of the department were also taken to the laboratory to understand the benefits. Dr S Suganthi also creates interest in younger minds through inculcating research culture in the department. There are antenna aspirants who have joined her venture as a team of members comprising co-principal investigators, subject specialized faculty members, research assistant, research scholars and project students. 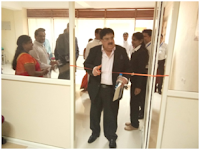 Two state of the art, new research laboratories - Pharmaceutical Chemistry Lab (PCL) of Chemistry Department and Applied and Industrial Biotechnology Lab of Life Science Department were inaugurated in Block 2, 3rd Floor by Novozyme India and Asia Pacific R&D Director - Dr. Ashish Paradkar. 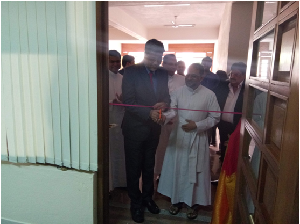 The occasion was graced by the presence of Fr.Dr.Thomas Mathew, Vice Chancellor of Christ (Deemed to be University), Dr. Abraham V.M., Pro Vice Chancellor, CFO and HOD of Life Sciences Department. - Fr. Jobi Xavier, Dean of Sciences and HOD of Chemistry Department,Dr. 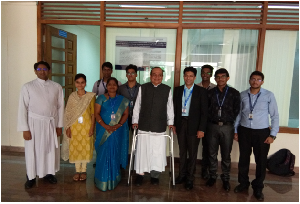 Surendra Kulkarni, Registrar Dr. Anil Pinto as well as the faculty, staff and students from various departments. Both the labs were blessed by Fr. Thomas C Mathew and Fr. Jobi for its success. On this occasion,Dr. Ashish praised the support and commitments of CHRIST (Deemed to be University) management towards R&D infrastructure development and pushing the R&D efforts in University. 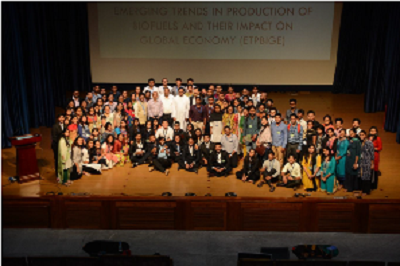 National Conference on Emerging Trends in Production of Biofuels and their Impact on Global Economy was held on July 27 and 28, 2018 in the KE Auditorium, Block IV, Main Campus, CHRIST (Deemed to be University), Bangalore. The chief guest of the conference was Dr. G.R. Naik Pro-Vice Chancellor, Central University of Karnataka, Executive Member of Karnataka State Biofuel Development Board. 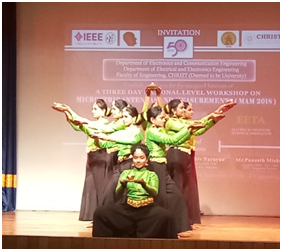 The inaugural event started with an invocation dance by students of Life Sciences. It was followed by lighting the lamp where Dr. (Fr). Thomas C Mathew, Vice Chancellor, CHRIST (Deemed to be University), Dr. G.R. 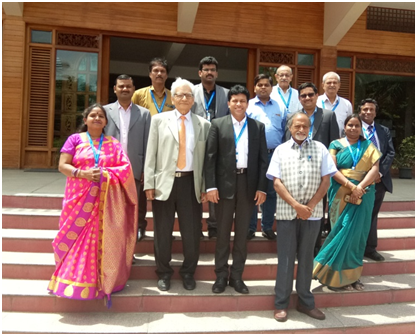 Naik, Pro-Vice Chancellor, Central University of Karnataka, Executive Member of Karnataka State Biofuel Development Board and Dr.Chenna Reddy Aswath, Principal Scientist, IIHR, Bangalore. Dr.Udipi Shrinivasa, Professor, IISc, Bangalore along with organizing secretary did the honors. The welcome address was delivered by Dr.Erumalla Venkatanagaraju. This was followed by release of conference e-proceedings, presidential address by Dr. (Fr). Thomas C Mathew, Vice Chancellor, CHRIST (Deemed to be University), inaugural address by chief guest Dr. G.R. Naik, Pro-Vice Chancellor, Central University of Karnataka on Biotechnological Approach for Improving Biodiesel Production from Nonedible Tree Borne Oil Seed Plants on Waste lands of India, key note address by Dr.Chenna Reddy Aswath, Principal Scientist, IIHR, Bangalore, on Use of Bioreactors in Plants and key note address by Dr.Udipi Shrinivasa, Professor, Department of Mechanical Engineering, IISc on Biofuels. Technical session was began with the lecture by Dr. Harini Kumar K.M, Professor, University of Agricultural Sciences, Bangalore on Biofuels for Next Generation followed by Mr. Sondur S.N, Principal Scientific Officer, Karnataka State Council for Science and Technology, Bangalore on Applications of By-Products obtained in Biofuel Production on first day and Dr. V. Sivasubramanian, Director, Phycospectrum Environmental Research Center, Chennai on Algal Biomass Production for Bio-Fuels: Challenges. Dr.Girisha ST, Professor, Bangalore University, Bangalore on Bio Diesel – The Next Generation Alternative Fuels on second day. 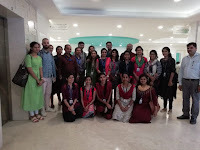 After technical session researchers from various research institutes presented their research work in the form of oral and poster presentation, chaired by Dr.Girisha, Dr. Suma, Mr. Sondur S.N, Prof. Ganesh, Dr. Harini Kumar, Dr.Manikantan and Dr.Siddarthan. 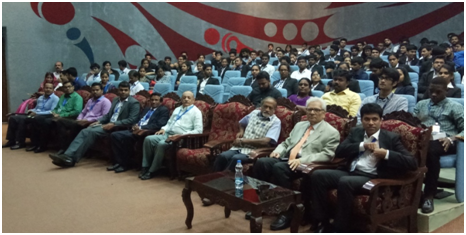 Valedictory Function was started with Dr. Vinod J Lakkappan, Senior Scientist & Deputy Director, Karnataka State Forensic Science Laboratory, Bangalore followed by the presentation of best research papers by Dr. V Lakkappan, Dr.Sivasubramanian and Fr. Jobi Xavier, Head, Department of Life Sciences, CFO, CHRIST (Deemed to be University). The conference concluded with the vote of thanks by Dr.Paari KA, Co-Convener, ETPBIGE-2018. An initiative was taken up the students of the Life Science Department, under the guidance of Dr Suma S, to collaborate with the Stem Cell Registry of India (SCRI), to host a Stem Cell Awareness and Donor Registration Drive within the main campus of CHRIST (Deemed to be University) on 3rd August 2018. This event was made possible with the approval and encouragement received from the HOD of Life Science Dept., Fr. Jobi Xavier. 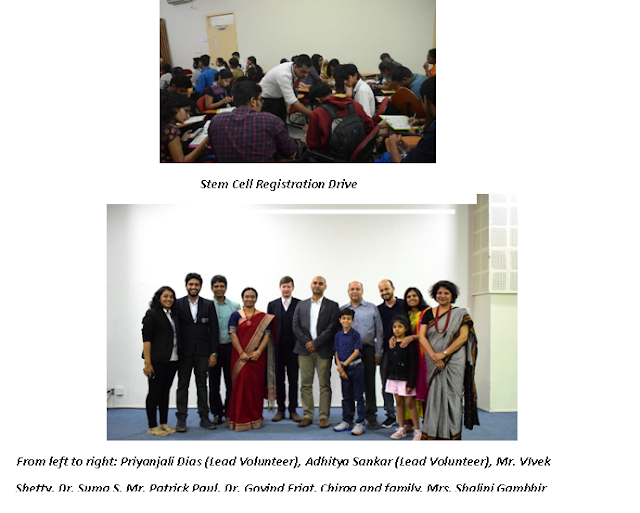 The SCRI Head of Donor Recruitment and Communications, Mrs. Shalini Gambhir and her team comprising of Ms. Deepti Adhikari, Mr. Vysakh Shaji and Mr. Simon Joseph Das were in charge of training the volunteers involved in the program on the importance of becoming potential stem cell donors and the procedures involved during the registration process like filling up registration forms, administration of the buccal swab, barcoding of the samples, etc. The lead volunteers from CHRIST included Ms Priyanjali, Ms Chitanshi and Mr Adithya (BCZ final year students). 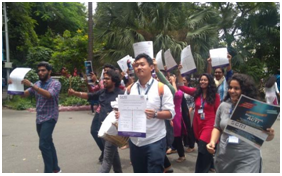 Throughout the final week prior to the event, rigorous efforts were made by the volunteers to mobilize students from different academic backgrounds on the importance of this registration drive through charts, models, posters, rallies, announcements in classes and various forms of social media like WhatsApp, Facebook etc. Dept of Life Sciences, CHRIST. The Associate Dean of Sciences, Dr George Thomas addressed the students on the importance of the drive. 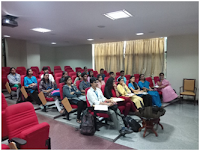 Dr. Govind Eriat, Consultant for Haemato-oncology and Bone Marrow Transplant Physician at Fortis Hospital, Banerghatta Road and Mrs. Shalini Gambhir, SCRI – Head Donor Recruitment and Communications delivered the lectures. This was followed by a short video explaining the stem cell donation process and the benefits. The other distinguished guests who were present during the occasion were Mr. Patrick Paul, Consultant – Finance and administration for DKMS heading India division and Mr. Vivek Shetty, Consultant- Business Development for DKMS heading India division. Both of them stressed the crucial need for a bigger stem cell registry in India. A very special guest, Chirag, an eleven year old Thalassemia fighter and survivor, who had previously received a stem cell transplant briefed the audience on how much of a difference a potential donor can bring about in the receiver’s life. Ms. Priyanjali Dias gave the vote of thanks. On the whole, the Registration Drive was a huge success with 542 potential donors signing up, which included several students as well as faculty members.